If I aim to be sincere as a homeschool mum I must live by the same standards, the same ideals, the same principles and practices as I teach my children. I thought I might put myself through a test. Like to join me? Do I put a priority on the time I spend with my God? Do these daily appointments get squeezed short, or neglected, by other commitments? Do I put relationships first (or do I get task orientated). Can I lay aside my best lesson plans for a child who needs a hug, or a heart that needs an attitude adjustment? Do I pursue my responsibilities before reading a book, scrapbooking, or writing? Do I have character established in my life? Practicing good habits? Do I enjoy God’s creation, marveling at His handiwork? Do I love to learn? Or do I only pick up a book to stay current with my children’s education? Can I study by myself on topics of interest to me, being self-initiated and self-motivated or do I only pursue knowledge to teach to my children? Do I read books, feeding my mind with living ideas? Or do I only read self-help, instructional books? Do I seek wisdom in what I read, applying the Word of God, finding practical applications? Do I research any queries that come to mind, do I share what I learn with others, maybe inspiring them to learn more? Out of ten questions, how did you score? This list was adapted from our Guiding Principles for Discipleship Homeschool. I dearly want my children to see me as genuine, authentic, sincere, real. If the principles are good enough for my children to live by they must be right for me too. In our culture we are very good at segregating our lives. This is my time, this is his time, this worship, this work… and so forth. Alternatively, if we try to see ourselves instead of leading the pack so to speak, like mother duck with the little ducklings following behind in a neat little row, and see ourselves more in the middle of the pack enjoying life together we will have a better understanding of how we can really learn along side of our children. Or better yet, have our children learn along side of us. 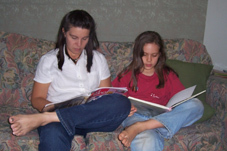 Do I take on the character lessons that I teach to my children? When we learn about orderliness do I try and improve my areas of the house? When we learn about perserverance do I tackle those hard jobs? Do I tell the truth, all the time? When we are out in Nature am I so concerned that the children "get the most from this opportunity" or do I sit and absorb the wonder of it all for myself? If our model of learning is based on living books, conversations, research and writing, these are all things that we can do while the children are doing them too. What was the last living book you read? Did it evoke fresh thoughts? Did you share them with anyone? Read more about Sincerity and how we can teach this character trait to our children.